Welcome to another installment of LiveAnalysis! Today we have the fifth meeting between World No. 4 Li Na and World No. 24 Dominika Cibulkova. The head-to-head stands 4-0 in favor of Li Na, who’s only ever lost one set against Cibulkova. No preamble – let’s just jump into the action! First Set – Dominika Cibulkova will serve first. 0*-0: FHs are traded in the first rally of the game, and it’s Cibulkova’s which sails long. That happens again, so 0-30. Li Na then narrowly misses a FH lob long, so 15-30. SW out wide, 30-30. Li Na then tries to get Cibulkova off of her preferred spot in the middle of the baseline, but ends a FH DTL long. 40-30. Good return by Li Na triggers Cibulkova’s error, so Deuce #1. DF #1 for Cibulkova, so AD Li Na, Break Point #1 for her. Li Na yanks Cibulkova from side to side, and when she steps inside the baseline to hit a CC BH, she pulls it wide. Deuce #2. A fun rally ends with Li Na finding Cibulkova’s Deuce corner with a gorgeous BH DTL winner. Break Point #2. 2nd serve… and it’s a DF, #2 of the match, that hands over the break. Goes without saying that Cibulkova played a terribly sloppy game. However, I thought it was interesting (and coherent) that Li Na was trying to get Dominika away from the middle of the court as often as she could. Li Na wasn’t being able to find the corners all that consistently, but that sounds like a very valid scheme against Cibulkova, who has to work quite hard to cover the far edges of the court. 0-1*, Li Na: A wild I-O BH by Li Na flies into the bottom of the net for 15-30, off a good return by Cibulkova. Bizarre shot selection there. Botched BH 2nd serve return by Cibulkova, 30-30. Another great BH DTL Li Na makes it 40-30. Another botched 2nd serve return by Cibulkova seals the consolidating hold for Li Na. Again you see how effective it will be for Li Na to find the corners of the baseline. Cibulkova loves to boss the middle of the baseline, so if China’s No. 1 can find some extra space to give herself a little more margin, even better. As for Cibulkova, she’s doing her thing – trying to dominate rallies from that preferred spot of hers, and trying not to miss that many FHs. It was quite key for Cibulkova to escape that game, and Li Na will surely rue the missed opportunities to go up a double break. There seemed to be a little bit of hesitation in Li Na’s shots in that game, which is never, ever a good thing. Bad things happen (particularly to her FH) when she doesn’t fully commit to all of her shots. 1-2*, Li Na: Another BH DTL winner plus a lucky letcord give Li Na a 40-15 lead. A CC FH by Cibulkova goes long, and hands Li Na the easy hold. Cibulkova just can’t cover that Li Na BH DTL if it’s hit with decent pace and within 2 feet of the baseline and sideline – her short reach makes it incredibly tough to defend. This is a key shot to monitor, since it will most likely be effective for Li Na…but it’s not an easy shot to hit consistently. 1*-3, Li Na: A long DF by Cibulkova comes at 40-0, followed by an I-O BH UFE by the woman from Slovakia. So 40-30. However, a FH DTL UFE by Li Na hands her the somewhat easy hold. Li Na already has 4 FH groundstroke UFEs in 5 games played. 3 BH UFEs, too. Cibulkova? 5 and 2, respectively. 2-3*, Li Na: Li Na tries to get Cibulkova on the move, but Dominika resists the onslaught, and then turns the tables on Li Na, yanking her from side to side and finishing with an emphatic BH winner at net. Moments later, a wild FH UFE by Li Na makes it 15-30. A DF into the net gives Cibulkova Break Point #1, 15-40. A simply atrocious DF – this one way long (meaning, about 2 feet long) hands over the break. That was pretty sad service game by Li Na, obviously. She’s getting tighter and tighter, and Cibulkova seems completely comfortable with the occasion. 3*-3: It’s 40-0 in a flash. Cibulkova took advantage of another FH UFE by Li Na, but fires an I-O FH winner to reach that point. DF, 40-15. A beauty of a Deuce court slider by Cibulkova hands her the consolidating hold. 4-3*, Cibulkova: As other facets of her game flounder, Li Na’s BH comes to the rescue – another BH DTL winner makes it 15-0, and some good CC ones force Cibulkova’s error, so 30-0. However, Li Na does put a short FH away, so she has a chance to level this set. Some great BHs do the trick. BREAKING: Li Na’s 1st serve percentage is at 29%. 29%!!! That’s…problematic. 4*-4: Li Na commits to a short FH, and doesn’t miss. 30-30. However, a 1st serve BH return goes long, so 40-30. Cibulkova then hits a beauty of a dropper…but commits the mistake of not following the shot into the net. Li Na tracks it down, and fires a fantastic BH DTL winner from a very awkward position of the court. Moments later, yet another FH UFE by Li Na gives GP to Cibulkova, but a DF (her 5th of the match) erases it. Li Na gets a fantastic return in play, and puts away the resulting short ball. Break Point #5 for Li Na. Another bad FH UFE by Li Na sends the opportunity begging. Now a lucky letcord gives Dominika a chance to escape yet again, which she does after, you guessed it, a bad Li Na FH UFE. The thing about a lot of these Li Na FH UFEs is that they’re not even shots that are designed to either end the point or give her control of the rally. Just regulation rally shots that fly long. 5-4*, Cibulkova: For once, Li Na hits a very good I-O FH to go up 15-0. But now Cibulkova feeds Li Na some of her own medicine with a great BH DTL early in the rally. 15-15. Anyway, it’s 40-15 after Cibulkova narrowly misses a FH DTL. Moments later, an Ace up the T (1st for either woman) clinches the nervy hold. Another repeating pattern: missed BH returns by Cibulkova, particularly from the Deuce court. Big reason why this set is on serve, given Li Na’s mounting UFEs and bad 1st serve %. 5*-5: Cibulkova plays a tactically brilliant point to get us started – targets Li Na’s FH corner after every two or 3 shots, only to then hammer it twice in a row to force the error. However, a fantastic I-I FH return winner by Li Na levels the score. A DF (her 6th) makes it 15-30. Then, simply glorious tennis from Li Na, who fully engages a CC FH, which ends up opening up the court for a simple CC BH winner. 15-40, Break Point #6 for Li Na. A decent FH return up the middle is enough to clinch the break after Cibulkova can’t handle the pace. It must be said…it wasn’t a huge FH, either – just decent pace, decent depth. 5-6*, Li Na: Li Na’s FH is going through an unexpected resurgence – it was the key shot that got her the break, and now gives her a 15-0 lead. And just as I type that, Li Na barely misses a FH DTL. Went for the line when a foot inside would’ve been more than good enough. Then a wild, wild FH CC UFE by Li Na, and it’s 15-30. However, a good serve triggers a short return that is easily handled by a CC BH winner. 30-30. And then…horrorshow by Li Na at net. She had a very, very makeable FH volley, and she didn’t come close to getting it over the net. Break Point #2 for Cibulkova. 2nd serve…and Li Na’s FH comes to the rescue! Cibulkova had hit a wonderful CC BH return, but Li’s response was just as good, and short FH was a natural consequence. She does not miss. Deuce #1. Cibulkova then hooks a CC FH, so it’s Set Point #1 for Li Na. She goes for a big BH DTL winner into a wide open court…and misses it wide. Again, no need to go for the lines here – no way Cibulkova covers a B- shot there. Now a huge FH DTL by Cibulkova gives her Break Point #3. Cibulkova hits a great return, survives Li Na’s fantastic reply, and drills a CC BH that Li Na can’t handle. She’s forced a Tiebreak! Tiebreaker – Dominika Cibulkova will serve first. 0*-0: Beauty of a Li Na FH DTL return winner. MINIBREAK. 0-1*, Li Na: 2nd serve…and then a great BH DTL winner by Li Na. 0-2*, Li Na: Now a fantastic FH DTL winner by Cibulkova, set up by a great CC FH return. MINIBREAK. 1*-2, Li Na: Fantastic hitting into the open court by Li Na, who ends up pushing Cibulkova way behind the baseline and yanking her all over the place, finishing with an easy FH winner. MINIBREAK. 1*-3, Li Na: Wild BH UFE by Cibulkova after a decent Li Na return up the middle. MINIBREAK. 1-5*, Li Na: Li Na stops play after a Cibulkova FH that seems to have landed long. Hawk-Eye shows the ball to be barely in. MINIBREAK. 2*-5, Li Na: Li Na peggs Cibulkova into her BH corner, but instead of approaching the net on a BH DTL (into the open court), hits the approach straight at Cibulkova who hits a good pass, and then chases down Li’s volley to put it away with a glorious FH CC pass. 3*-5, Li Na: A sloppy FH UFE by Cibulkova as she yet again can’t handle Li Na’s return. Set Point #2 for Li Na. MINIBREAK. 3-6*, Li Na: Li Na targets Cibulkova’s BH with gusto, and it works – she’s clinched the set. First Set to Li Na, 7-6 (3). Second Set – Li Na will serve first. 0*-0: Li Na avoids going down 0-40 by hitting a huge I-I FH that Cibulkova cannot put back in play. 15-30. Yet another botched BH return by Cibulkova, so 30-30. Li Na then puts away a FH swinging volley, so 40-30. A Cibulkova FH goes long, clinching the hold for Li Na. 1-0*, Li Na: Li Na blasts a FH DTL winner to make it 30-40, Break Point #7 for her. A wild CC FH UFE by Cibulkova seals the break. 2*-0, Li Na: A huge SW up the T makes it 40-0, but Cibulkova once again hits good passing shots to make it 40-15. Then a sneaky FH DTL winner makes it 40-30. However, another fantastic BH DTL winner seals the consolidating hold. Time for Cibulkova to go all in on schemes that try to break down Li Na’s forehand. Dominika has been casually trying to engage Li Na’s BH way too much with neutral balls – it’s the other side she needs to target in order to unsettle the woman who’s already up a set and a break. 3-0*, Li Na: Li Na doesn’t waste the opportunity to dictate with her great BH, and levels the game at 30-30. Another fantastic array of BHs gives Li NA Break Point #8. And another one – a huge CC BH return forces the error, and clinches the double break. 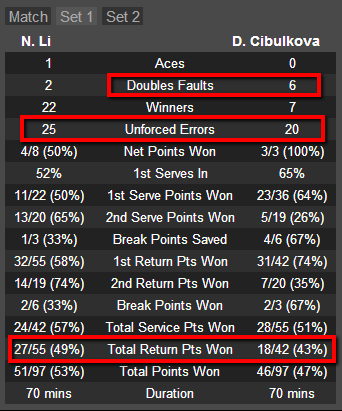 Li Na hit way too many BHs in that game – and it was a Cibulkova service game, in which you might expect the World No. 24 to have chances to dictate where the ball goes at the beginning of rallies (and with her serve). 4*-0, Li Na: Some good FHs allow Li Na to level the game at 30. Previously she had DFed once. Great SW out wide, 40-30. Later a simple FH putaway clinches another consolidating hold. 5-0*, Li Na: A fantastic BH DTL (haven’t I typed that a lot?) gives Li Na 0-15. A great CC BH makes it 0-30. Then, a supremely lucky letcord winner makes it 15-30. Li Na was in full control of that point. Then luck turns the other way, as a speculative Li Na shot clips the line, falls on Cibulkova’s side of the court, and the World No. 24 can’t effectively put away the shot. 15-40, Double Championship Point. Li Na gets a good return up the middle in, but later botches a FH long. Champioinship Point #2… and it’s converted when Cibulkova sends a regulation FH long. 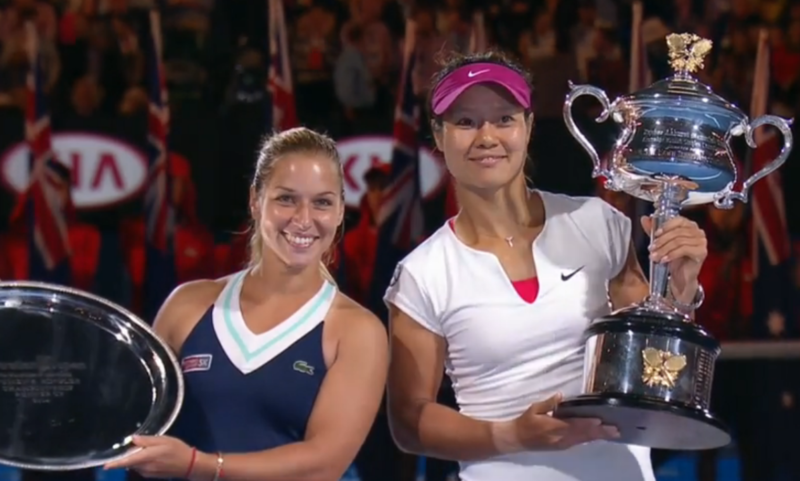 Li Na has won the Australian Open! Game, Set, and Match to Li Na, 7-6 (3), 6-0.